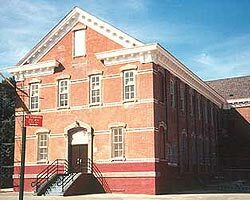 P.S.1, NYC School Construction Authority. Yetman Street, Staten Island, NY. 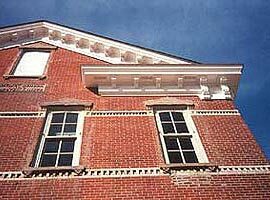 Fabricated, finished and installed built-in Eastern white pine gutter and 5'H cornice system for this 1878 brick building. 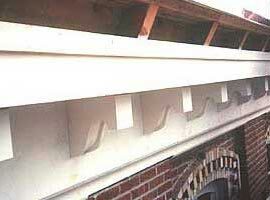 Fabricated (170) five element modillion brackets, some with pierced fretwork ornamentation 3'H, along 300' length. 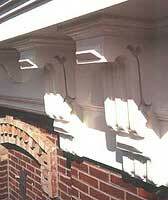 Restored deteriorated gable ends. Work performed July 20 through August 31, 1999. Building listed in National Register of Historic Places. 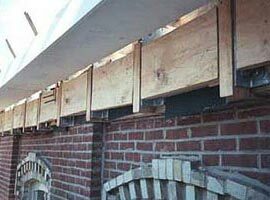 Solid pine, up to 16" wide, was utilized at Olek's increased cost even though marine plywood was specified, for the superior longevity of the gutter installation. 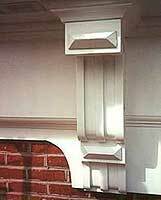 200 modillion brackets and 33 pierced fretwork brackets were recreated in pine. 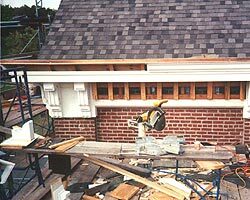 In only 5 weeks the work was completed, despite custom molding changes necessitated by masonry errors in the roof sill. 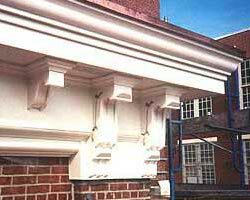 Project initially was to allow 4 months for wood gutter/cornice system.